Andy Golay was inspired after reading One Day in the Life of Ivan Denisovich by Solzhenitsyn, who detailed a day in his life as a political prisoner in the Russian Gulag. Golay was working at a supermarket deli at the time. Not that working in a deli is the same as being in prison, but it got him thinking: What about one day in the life of a deli worker? Why would that be interesting? Why would anyone want to read it? We have all these little interactions during our day, especially in customer service, where we say, "Have a nice day... Have a good one... Take care..." etc. And that can be awesome. What if, by saying something like that in a really effective way, you could make someone have a great day? Johnny is on a mission, to help one woman have a nice day. She's influential but not necessarily in her best space. If Johnny can help pick up her spirits, maybe it can change the world. Johnny Starks Deli Messiah asks the question, "Do the little things matter in life?" Andy Golay's goal for this book is for us people to see all our day-to-day activities in a new, maybe even profound and powerful, light. You can get a copy at CreateSpace, the self-publishing platform Andy used for publishing. He's listed as "Andrew" on the book cover, just fyi. 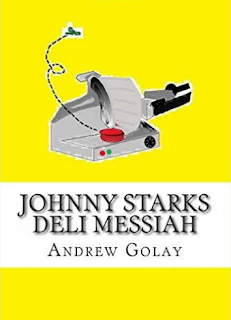 He would love for you to contact him at support@andygolay.com with feedback, social or business invites, questions about publishing your own book, entrepreneurship, or whatever you want to share.